For 24 years Georgia Southern University College of Education Alumna Elisabeth Hardy, Ed.D., has served as an English teacher in classrooms across Georgia, Virginia and South Carolina. Named Aiken County Teacher of the Year for 2015-2016, Hardy was also one of five teachers recently honored by the South Carolina Department of Education as a nominee for the state’s title of Teacher of the Year. Though she was not named the recipient of the state title, Hardy will serve on the South Carolina Teacher of the Year Honor Court for the upcoming year. Hardy says to fully understand the impact of these achievements, you must understand what the past year has entailed. Her husband, Kerry, was diagnosed with lung cancer in September 2015. 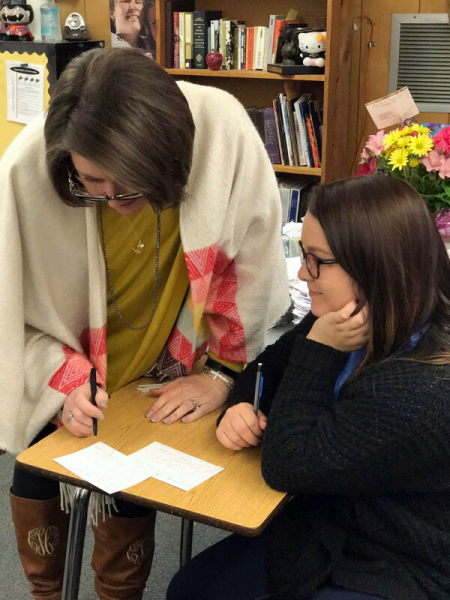 Now reaching her fifth year at NAHS, Hardy was overjoyed to find out she was not only the school’s Teacher of the Year, but she was nominated for the title of the district’s top teacher as well. She explained that on the day of the district banquet, she was sick, lost her voice and had her husband’s upcoming appointment for scans and treatment on her mind. Hardy says she cannot take all of the credit for her recent accolades. 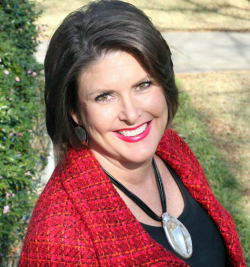 As the district’s top teacher, Hardy was appointed to the Aiken County and South Carolina teacher forums which discuss and address educational issues on the district and state levels. Her learning and growing experiences have been too many to count, and she says the support from her community only reaffirms the passion she has for her chosen profession. Hardy pictured working with a student at North Augusta High School. Hardy knew in high school that her interests included English and teaching. “I could think of no greater calling, especially since my grandmother was a teacher and had been such a wonderful influence and two of the people I most admired were teachers, as well,” she explained. While working as a full-time educator, Hardy earned a master’s in adult vocational learning and a doctorate in curriculum studies from Georgia Southern. She also plans to continue writing, publishing and presenting at conferences as well as collaborating with her peers to expand and grow her knowledge.